As we were putting together our Science Activity Packs this year, I realized that we needed to have an option for babies and toddlers. This year, we're lumping babies in with our preschoolers and school-age kids because developing another separate program when we were changing SO MUCH was too overwhelming. But our Science Activity Packs were not baby-appropriate. I turned to one of my employees who recently had a new baby and asked her what she thought would make good baby-appropriate prizes and we decided on the Bright Starts Lots of Links toy and farm animal bubbles from Oriental Trading. 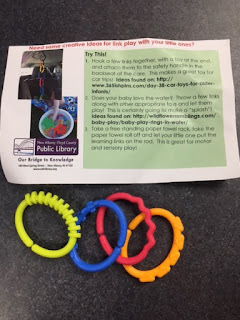 It got me thinking that probably any toy or prize you offer for your Summer Reading/Learning could be an "activity pack" and offer ideas of how to carry on the learning at home. Yes, it's more work to put together an activity pack than it is to just hand someone a plastic toy, but if it's feasible for you it might be worth it. Color-Your-Own Flower Pots. This is an easy one! Buy a big bag of sunflower seeds and encourage kids to germinate and plant their own seeds. Or even if you don't include the seeds, you could include a list of books about flowers and gardens or instructions for how to plant a seed and what to watch for as it grows. Racing Car Building Block Kits. Build your car and then test how far it will roll. Create an inclined plane with a propped-up book and measure how far your car will roll. Record it. What happens if you make a steeper incline? What happens if you make a shallow incline? How steep can you make the incline before the car topples over? Test, record, and compare your results. Build a Better World Water Bottle. Get outside and move (or move inside!). Include some activities or games that kids can play to get moving and get their hearts pumping. Or you could include information about why it's important to keep hydrated or why it's a healthier choice to drink water than to drink sugary drinks. Jacob's Ladder. The Jacob's Ladder toy operates using a kinetic illusion that makes it look as if one of the blocks is traveling all the way down to the end. Pair this toy with information about optical illusions that they can share with friends or a family member. Science Sparks has instructions for an easy activity for kids to create their own optical illusion. Color Block Bouncing Balls. Hold your bouncing ball straight out in front of you and drop it. How high does it go? What happens if you release it from a higher or a lower height? Experiment with trajectory ala Angry Birds. Set up a block tower or a stack of cardboard boxes and try bouncing your ball from the floor to your structure to knock it down. Did you aim correctly? If not, adjust and try again. Construction Hats. These are a great toy for some imaginative play. An activity guide for this prize might include some info for parents on why imaginative play is important and suggest some ideas for other props to extend the fun. Wooden spoons could be hammers, a large cardboard box could become a backhoe, bulldozer, or other construction equipment. Propellers. How do propellers work to lift things off the ground? Can you think of a way to measure how high your propeller is flying? What happens if you slide your hands more quickly or more slowly? Can you aim your propeller at a target? How close did you get? Experiment with how you can get closer to your target. Bubble Illusion. Here's another one for optical illusion activities (see Jacob's Ladder above). Flying rockets. Test how far your rocket will go. If you pull the rubber band farther, how does that affect the rocket's flight? Why does a rocket have fins? Can you design different fins for your rocket and attach them? How does that affect the rocket's flight? Geometric Light-Up Bouncing Balls. See activities for "Color Block Bouncing Balls" above, but also ask yourself how does the shape of the ball affect the bounce? These balls are made up of geometric shapes, so how does that affect the height and how easy it is to aim? Water Bottles. See activities above. With a little creative thinking and research, almost any toy incentive can lend itself to at-home learning. 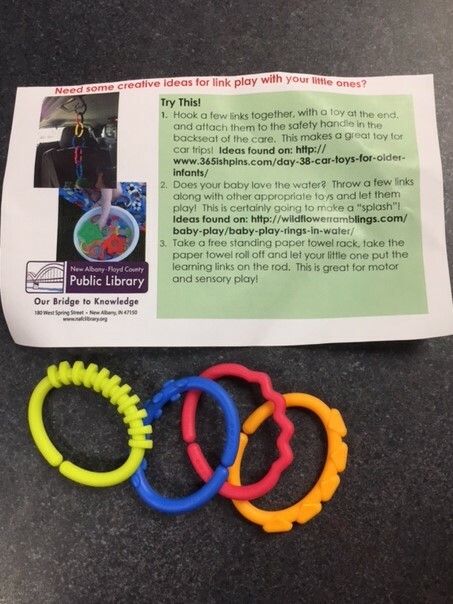 If you don't want to create activity packs or separate instruction sheets, maybe you could put extension ideas on your website, include them on your summer reading log, or create a poster to put up at your prize station and encourage parents to take a photo of it. What prizes are you offering for Summer Reading/Learning this year? How do you think your prizes could encourage learning to continue at home?